The Proform 10.0CE Elliptical Trainer is intended for those on a budget or those with limited workout space. The trainer is only 74 inches long but folds up to half that when not in use. This feature contributes to a lower maximum user weight of 275 lbs, which is on the optimistic side. 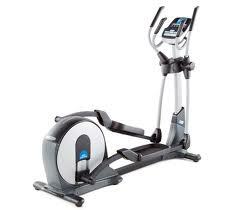 The Proform 10.0CE Elliptical Trainer also has adjustable stride length, you can choose from 16, 18 or 20 inches, the latter actually quite impressive. The Proform 10.0CE also includes upper body arms for better cardio and large, padded foot pedals for better comfort. The backlit display is easy to read and controls 20 levels of resistance and 18 training programs and with iFit Live you can download more and track your performance online. Considering the price, a music docking station with speakers, hand sensors for heart rate monitoring as well as a cooling fan are impressive extras. Warranty on the Proform 10.0CE elliptical trainer is OK, lifetime on the frame, 1 year on parts and labor. With the Proform 10.0CE Elliptical Trainer, you get a lot for not a lot. Definitely worth considering if you are on a strict budget.